Encryption transparency is the key feature of DbDefence. It is possible to apply encryption to the database and make it fully transparent for the 3rd party applications without changing the source code! It works for all kinds of applications: desktop, services and web applications. 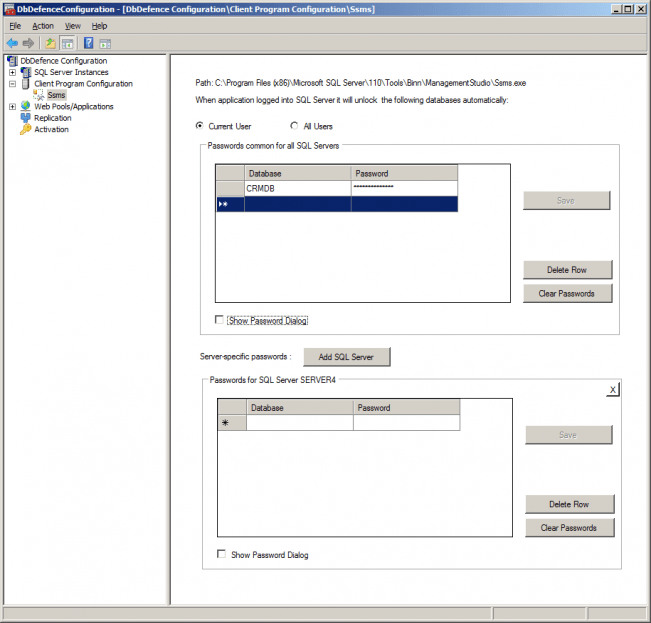 For example, it can be used for SQL Server Management Studio (SSMS) to edit the database after it has been encrypted. However, there is some preparation work, which must be done beforehand, in order to do so. Automatic database unlocking for all kinds of applications. Can prompt for password if you do not want to save it. Can be integrated into your application (if you can add some code). When to use the client dll: When you want to provide access to selected application from limited number of client computers. You can configure an application using Configurator to have an access to protected databases and unlock them automatically. You do not need to modify the source code of application at all and it can be done with little computer knowledge. Such an option is provided by DbDefence system drivers and services. The difference with the previous software versions is that now unlocking is done by a special driver/service and you do not need to specify passwords in the command line of the application as before. In the new version, all passwords are always hidden and not exportable. Suppose we encrypted a database and still want to have access from our computer to it as to unencrypted database, completely as before. You need to run Configurator and go to Client Program Configuration node and add the required application executable. Right click on Client Program Configuration and select "Add Program." In our case it is ssms.exe located in "C:\Program Files (x86)\Microsoft SQL Server\11\Tools\Binn\ManagementsStudio\ssms.exe"
You may specify passwords to be used by all applications without configuring each application separately and you may specify passwords to be used by all added applications connected to the SQL Server. You may specify several passwords for the same database. When an application is connected to a server, it will try to apply all passwords. Please note that this procedure runs at each connection and may delay connection time for your application. So if you are worrying about the performance please, separate passwords for applications and servers. In that snapshot we entered a password for the encrypted database CRMDB to be used only by SSMS.EXE when connected to ANY SQL Server. You may enter several passwords for one database. The application will try it all until the database is unlocked. If you check Show Password Dialog box, the system will check the target SQL Server and show you the dialog only if there are protected databases that are still unopened. 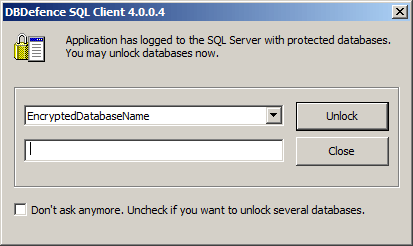 If there are no such databases, the dialog is not shown. When an application is added to the Client Program Configuration, it already benefits from SQL query encryption (even if no passwords required). All textual information traveling from the client to the server is encrypted automatically. If you want data from the server to the client to be encrypted too, you need to setup a reliable SSL connection (see SQL Server documentation). We made this "light encryption" to prevent network tools from sniffing database passwords. 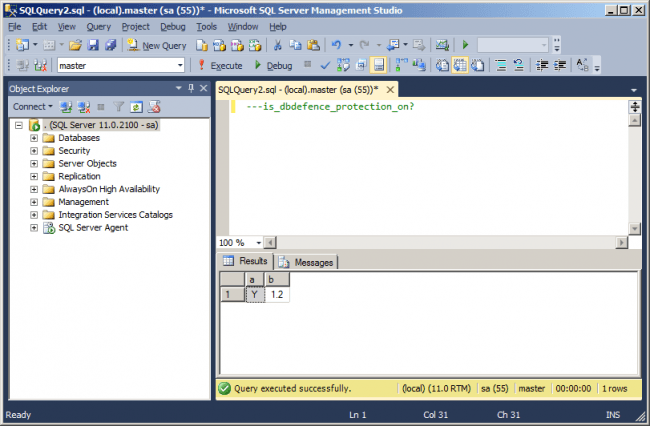 Y means that client is enabled for the application and DbDefence is running on SQL Server end. Number 1.2 is the encryption version protocol - not really useful to you: you may ignore it. They following is useful only if you do not want to add your application with Configurator and want to use "auto unlock" feature and SQL query encryption. All mentioned features are provided by a single dll called dbd_clnt.dll. You may find it in the SYSTEM32 and SYSWOW32 foldes. When an application makes a connection to the SQL Server, the dbd_clnt.dll intercepts it and does all the work automatically. You may not configure your application in Configurator, but you can simply load the library to your process and have the same effect. You need to call Initialize once as early as possible before establishing connection to SQL Server. Initialize (TRUE) skips dialog, or Initialize (FALSE) allows displaying dialog if there are locked databases on the server. Passwords added with AddPassword will be applied to all SQL Servers where client founds locked databases.